The CHW-12 Cuisinart coffee maker is considered to be one of the best programmable coffee makers, due to its great versatility, longevity and elegant appearance. If you’re looking for a durable coffee machine with great functionality at an affordable price, but you’re not familiar with this brand, reading the available Cuisinart coffee maker reviews can be a great starting point. Designed to make up to 12 cups of coffees in minutes, the CHW-12 programmable coffee maker has a convenient, built-in a hot water system, which makes it suitable not only for preparing coffee but also for teas, instant soups or hot chocolate. Because of the integrated 24 hour timer, consumers rave about its ability to heat up beverages automatically at any desired hour. Thus, if you’re searching for an affordable coffee machine able to brew coffee before you get out of bed, the CHW-12 Cuisinart coffee maker may be your best choice. In order to gain full satisfaction out of this product, take a little time to read our in-depth review outlined in this article. Two different types of filters are used with this Cuisinart coffee maker: for the coffee machine, reusable Gold Tone filters are used to remove impurities in order to maintain the beverage’s taste. The separated Hot Water System uses charcoal filters, specially created to eliminate unpleasant tastes caused by chemicals in tap water. But how are these filters different? Gold Tone filters are made of stainless steel and covered in a very thin layer of gold, which gives their name, so they never wear out as regular paper filters do. Obviously, this particular feature is the one that allows them to preserve the coffee’s taste and flavor during the brewing process. Gold Tone filters also have the advantage of fitting better in the filter holder, avoiding ground coffee overflow. Unlike regular filters, these ones can be cleaned using the dishwasher so not only do they save money on paper but as long as maintained properly, they can last a lifetime. And the price is not a concern – you can find them for around 10$. Charcoal filters on the other hand are designed to remove calcium, chlorine and odors from water before brewing so they’re useful especially for people using tap water for preparing coffee. These tools use the so called carbon filtering method, which uses activated carbon to absorb impurities and contaminants in water. So unlike cheap paper filters, charcoal ones also prevent the metallic flavor in beverages. Moreover, they can be used 60 times without the coffee’s taste being affected and they can be purchased for around 10$ (a pack of 2 filters). The Cuisinart programmable coffee maker is actually a pour-over machine, as the water is manually poured from the top into the two separated tanks. The special brew pause function allows you to have a cup of hot coffee even if the brewing cycle hasn’t finished. Several users have mentioned in their Cuisinart coffee maker reviews the fact that the feature they appreciate the most is the 24-hour programmability. It is an excellent feature, which is especially convenient for mums or busy working people, who have to get up early and never have the time to enjoy their coffee before going to work. The brightly lit control panel of the CHW-12 Cuisinart coffee maker has a digital clock and a blue back-lit LCD, which can be set before you go to sleep (to 1,4 or 12 cups) so that you can wake up to a delicious cup of coffee ready to be served. The maximum number of cups that can be brewed once is 12, but in case you need a smaller quantity of coffee, you can conveniently use the 1-4 cups setting. You do not have to worry about not knowing how much water to add – the carafe has permanent marks indicating the beverage’s level so you can use it for filling the water tank as well. The coffee machine measures 10.8 x 12.4 x 16.5 inches, therefore it’s a little larger than other coffee makers for home use, but this is because the machine also includes the hot water system. In comparison, a small electric kettle measures around 8 x 6 x 9 inches while a small home coffee machine measures around 9 x 7 x 6 inches, so the CHW-12 model is definitely space-efficient. Not to mention the Cuisinart programmable coffee maker weighs only 9.5 pounds, so it’s light enough to be easily moved from one place to another but at the same time heavy enough to be well made and resistant. A really attractive aspect of this model, is the maintenance process, which involves very little effort due to the materials from which the CHW-12 coffee maker is made. The stainless steel housing and the nonstick heating plates are very easy to clean and resistant to damage, so this coffee machine should have a long lifespan when used properly. While the glass carafe and filter holders are dishwasher safe, you will have to clean the base of the tool manually in order to remove debris. You can do this by wiping the surface with a soft, damp cotton cloth, never by immersing the base in water. Although the coffee maker has a self-clean function for daily cleaning, you’ll still have to decalcify the machine periodically (2-4 times a year) to maintain optimum performance. In case one of the coffee machine’s components gets damaged, you can always replace it by purchasing a new part, as Cuisinart offers replaceable carafe lids (5$ each), drip tray plates (8$), filter holders (8$ for Golden tone filters and 7$ for charcoal filters), coffee scoops (4$) as well as individual Gold tone filters and economical packages for charcoal water filters. Although the CHW-12 Cuisinart coffee maker comes with a glass carafe, thermal ones are also available (48$ compared to 25$ for glass jugs) so you can purchase a thermal jug that will keep the coffee’s temperature high even when removed from the heating plate. 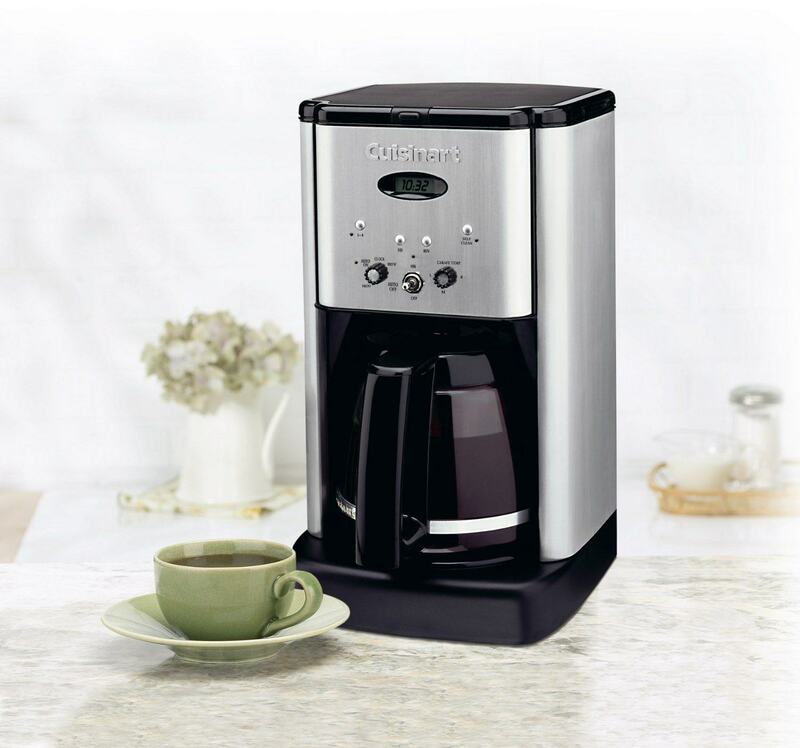 Currently there are over 100 Cuisinart coffee maker reviews written by users of the CHW-12 model. 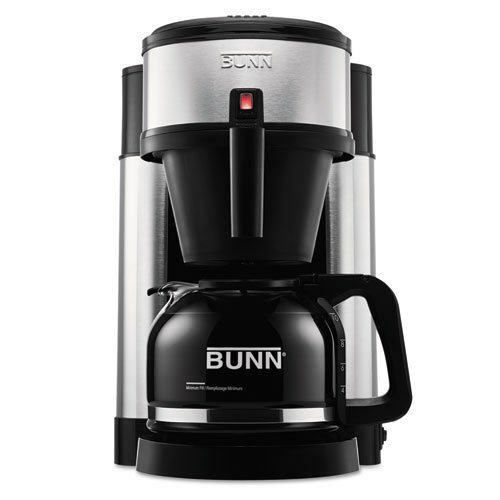 According to these consumer reviews, this coffee machine is an affordable, easy to use kitchenware appliances, which is easy to assemble, take apart and clean. This versatile model is in great working order, whether it used to prepare 12 cups of fresh coffee or just to heat up some water for tea. The Gold Tone filter for coffee is reusable so it will save you both time and money by not having to replace it after each brew. Various replaceable parts are available, the thermal carafe being probably the most attractive one for customers as it maintains the coffee temperature for the entire day. Still, if you’re not willing to invest in a thermal carafe, the beverage’s temperature can be maintained by simply setting the heater plate’s temperature to the desired level, as the CHW-12 machine features a Carafe temperature control with three different settings (low, medium, high). The Cuisinart coffee maker has easy to use lights indicating when the water is hot enough to be dispensed or that you need to refill the water tank, so you won’t have to open the covers and manually check the water level each time you want to prepare your coffee or tea. Also, the CHW-12 machine features a programmable blue back-lit LCD with a digital clock, which has a bright panel displaying everything at an easy-to-read glance. This characteristic is especially useful during the night and in the early morning, as it allows you to see the remaining time of the brewing process without having to turn the lights on. The removable drip tray allows you to use the coffee machine even with tall travel mugs so you can prepare your coffee or hot water and take it with you while traveling. The programmable coffee maker features an auto shut-off function so even if you forget to turn the machine off, it will stop by itself once the coffee or hot water is ready. Some Cuisinart coffee maker reviews highlighted the fact that the water is a little too hot to handle at the end of the program, but this is because the liquid is heated up very quickly, which is actually a good thing for people who don’t like waiting 15 minutes for a cup of hot chocolate. And this issue can be easily solved by simply turning off the hot water system manually, at any desired moment. Another customer complained the water was not recognized by the dispenser, but he realized this happened when a reverse osmosis water purifying system was used. These systems, although very efficient in removing large amounts of ions and contaminants from water, have the major disadvantage that they store the filtered water in a pressured tank. As water is used, the pressure drops off pretty quickly so even when the system is working properly, if the water’s level in the storage tank is low, it may take forever to fill a coffee pot! This problem can be solved by adding a booster pump to the reverse osmosis system, for increasing the pressure, or by simply using tap or bottled water, which work perfectly with the CHW-12 Cuisinart coffee maker.